The Department of Science at Waterford Institute of Technology (WIT) recently held its Industry Sponsored Awards Ceremony 2018 which was sponsored by Sanofi, Society of Foresters, Eurofins, Dawn Meats, Comeragh Veterinary practice, Dairymaster and AIB. Dr Peter McLoughlin, Head of School of Science and Computing congratulated all of the prize winners for their hard work and commitment to excellence in their area of study. He also acknowledged the staff in the department for their support for the students over the year. In acknowledging the contribution of industry to the awards Dr McLoughlin added “I would like to thank our industry partners for their continued support and commitment to our students and programmes. These awards are an important part of our engagement with industry and add enormously to the prestige of our programmes and are an important acknowledgment of the quality and innovation of our student’s work”. The Awards concluded with an address from Mr Paul Nolan of Dawn Meats. He congratulated all of the students on their achievements. He encouraged them to embrace the many opportunities that await them as they embark on another journey in their career. 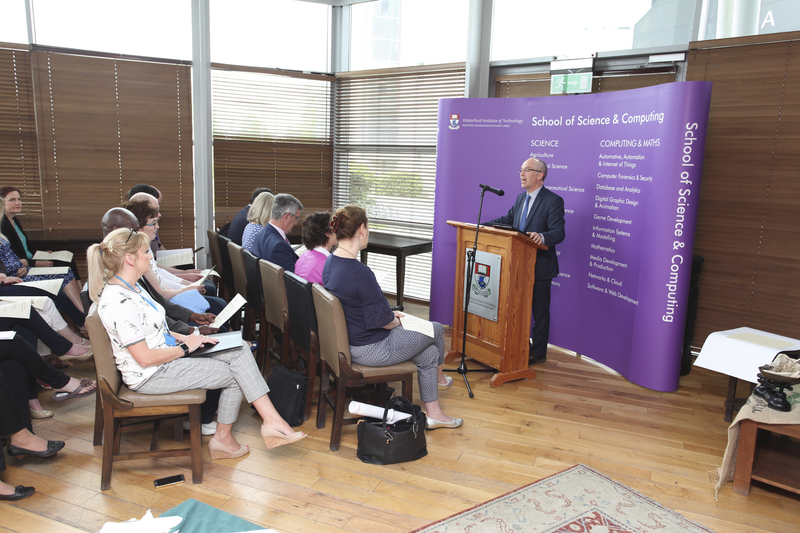 He also acknowledged the huge amount of work done by the management of the School of Science and Computing at WIT and complemented their efforts in their engagement with industry. Sinead Condon was awarded the Food Science and Innovation award, kindly sponsored by Dawn Meats. BSc (Hons) in Food Science and Innovation students develop a food product from initial design through to formulation, packaging and marketing, culminating in showcasing the finished product to industry. Sinead developed Mentaiko Cod Roe Bites. Her product concept came from growing up in a fish shop owning family and an eagerness to use what is considered waste – cod roe – for something appealing and accessible for all to eat. In picking Sinead, the judges praised the high quality of both product and packaging in particular, while also highlighting her enthusiasm for her chosen product. Paul Nolan from Dawn Meats presented the award. The awards, kindly sponsored by Eurofins Scientific, honoured the best project presentations from final year-students in the BSc (Hons) in Molecular Biology with Biopharmaceutical Science programme. Michelle Mannix from Eurofins Scientific attended to hear all presentations and to choose the winners. Sarah Foley was awarded the top prize for her project, “Construction of a plasmid library for synaptic receptor complex genes using E. coli Nova Blue”, followed by Jessica Murphy with “Intermediate-early genes and delayed primary response genes regulated by NmU in SKBR3-HER2 positive breast cancer cell line” and Eva McArdle with “Bovine carcass slaughtering processes – an analysis of the microbiological impact of timelines and the evisceration process”. Adam James and his project “Screening for antibiotic resistance genes in surface and urban water bodies” and James Cullen and “Evaluation of enzyme production in Bacillus used as probiotics for pigs” also received recognition as finalists. Students of the BSc (Hons) in Pharmaceutical Science course Laura Connolly and Lucas Bwema Vandi were the winners of the Final Year Research Project Poster Award which was sponsored by Sanofi. All students involved were required to analyse and summarise their laboratory work carried out over the semester and design, prepare and present a poster to staff and students. Each student presented a 3 minute pitch and answered questions on their project by the assessing staff members.The winning students demonstrated exceptional oral presentation skills, ability to summarise their project and technical writing skills with detailed understanding of their projects. Kevin O`Connor from Sanofi presented the awards. BSc in Agriculture project poster award was sponsored by Comeragh Veterinary Practice. The students in their final year of this three year degree presented their poster which outlined their project findings. The awards were won by Tommie Flynn whose project examined the management of mid-season grass sward quality and also by Ciaran Caffrey who's project compared conventional versus non-inversion cereal crop establishment methods. Chris McGrath of Comeragh Vets decided on the two winners and Anne Dunphy, lecturer at WIT presented the awards on behalf of Comeragh Veterinary Practice. The winner of the AIB BSc (Hons) Land Management (Agriculture) award was Stephen Kearns (Kilkenny) who investigated the effect of time in lairage on the quality of Irish beef. This work was carried out in conjunction with Dawn Meats. Second prize went to Des Twomey (Cork) whose work examined Carbon sequestration and leaching across a range of Agricultural Management Systems. Third prize went to John Richardson who examined the impact of feeding different types of milk replacer and also whole milk to calves and investigated the impact this would have on calf health and weight gain, and also the overall financial impact of the various systems. This work was carried out in conjunction with Agritech. Shane Whelan from the AIB Agri-Sector team heard the presentations of the students who had been shortlisted from the class and he selected the ultimate winner and the two runners up for this award. John McSweeney, AIB Branch Manager, The Quay, Waterford and Gaye O’Connell, AIB Head of Waterford & Kilkenny presented the awards. The award is to recognise the achievements of BSc (Hons) in Agricultural Science degree students with the best final year project presentation. The two winners were Aishling Neville and Ellen Fitzpatrick. The award helps students realise the relevance of their final year projects to a world beyond college. The bursary is very welcome in helping our students make the transition to the workplace following their studies. It also gives them an opportunity to excel and showcase their research to industry. The awards were presented by Niall O`Hanlon and Pat Ryan from Dairymaster. Conor Dowling from Kilmacow, Co. Kilkenny was the 2018 recipient of the Augustine Henry Memorial Medal, awarded by the Society of Irish Foresters to the final year BSc in Forestry student with the best assessment results. The medal was awarded by Mr. Gerry Murphy, Society President.